Attempting to create a truck that can adapt to varying load sizes designer Haishan Deng looked to nature for inspiration. 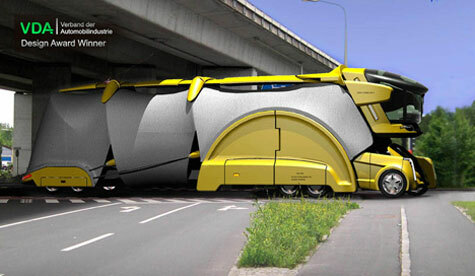 This bionic cargo transport uses an innovative segmented body remarkably like that of a centipede. This enables the truck to adjust its size to the cargo load. The resilient soft tarpaulin shelled body is strong enough to protect its cargo but also absorbs impacts in case of accidents. As an added benefit fuel savings abound since the truck’s weight is slashed in half.